I probably couldn’t have taken this shot with my Canon 7D and 17-40mm F4L. Not that there was anything wrong with that camera, it could and did take some very nice shots. The problem was it was big and heavy and consequently it spent most of it life in my Think Tank backpack accompanied by its other lenses, filters and accessories. I very rarely took it out for a walk, unless it was a specific photo walk. I didn’t grab it nonchalantly on my way out to the car just in case a picture presented itself; and I certainly didn’t slip it into my laptop bag on my way to work; apart from the fact that it didn’t fit, I just wouldn’t have considered it. I’m probably being a bit hard on the old Canon here as the same could be said for my Fuji X-Pro1. It spent most of its life in it Billingham Hadley bag with lenses, etc. However, since I got my little Fuji X100s it has gone absolutely everywhere with me, walks, drives and even to work and back and that is how this picture came to be. I was collecting my daughter at 7 pm one evening last week. 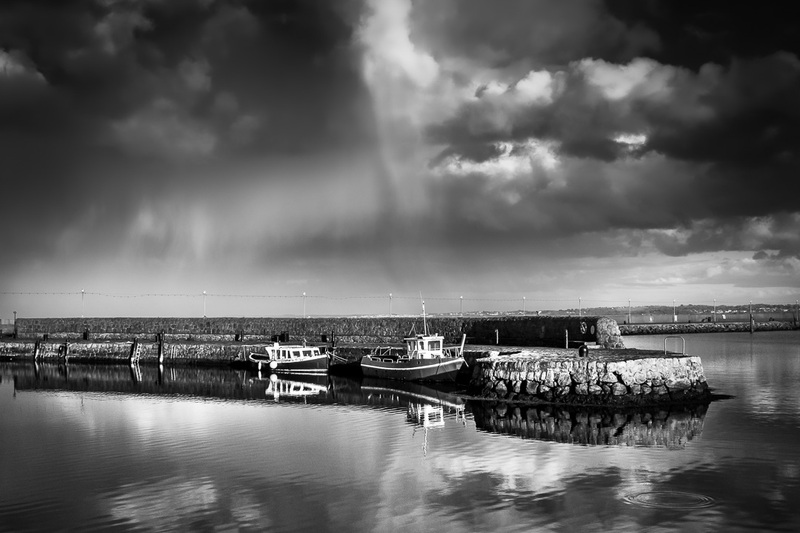 As I was driving towards the town of Carrickfergus it started to rain very heavily but just as I got there the rain stopped and the sun broke through revealing the picture of the boats in the harbour sheltering behind the harbour wall. Nothing remarkable in that itself but normally I would have missed the shot, or at best grabbed a quick iPhone image. However, on this occasion I had the Fuji X100s on the seat beside me. I only managed a few frames before the light went but at least I got this one. As Chase Jarvis says, the best camera, is the one you have with you! ← Making the best of what you’ve got!